MIAMI - According to the latest study conducted by the Consumer Product Safety Commission's National Electronic Injury Surveillance System (NEISS), more than 1.9 million individuals had a sports-related injury that was treated in the recent years. More than 231,000 baseball injuries were treated, 83 percent of the injuries were among men. Among those injuries, broken and/or dislocated fingers and wrist bone fracture. With so many bones, ligaments, tendons, and joints keeping hands and wrists working, there is ample opportunity for severe injury. 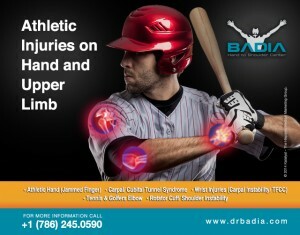 In fact, injuries to the hand and wrists are some of the most frequently acquiring inquiries facing athletes today. The most common sports-related hand and wrist injuries can be classified into two main categories, traumatic (acute) and Overuse (chronic). “Major fractures of the hand or wrist occur only during high-speed contact or in older athletes who may have osteoporosis. Complex fractures below the elbow can occur and there is a great variation in the fracture patterns. It is important that an upper extremity specialist evaluate these injuries, as recovery of full wrist and hand range of motion is often difficult. Fractures of the upper arm (humerus) may also result from this injury and can even extend into the shoulder joint.” – States Dr. Alejandro Badia, Leading Hand and Upper Extremity Surgeon at Badia Hand to Shoulder Center. Overuse (chronic) injuries are more likely to occur in athletes who engage in sports that require them to repeat a particular movement (i.e., baseball, soccer, tennis, or golf). Overuse injuries are likely to be stress induced and include tendon inflammation and dislocation, nerve injury, and overuse stress fractures. Chronic injuries have a higher tendency to develop long-term effects. However, long-term disability is less likely to occur from overuse injuries than from traumatic injuries. An athlete’s performance may significantly diminish, if the chronic injuries are left untreated. Surgery may be required if the overuse chronic injuries persists and continues to develop over time. Contact your doctor or a specialty physician if mild wrist pain, bruising, or swelling after the injury lingers or does not improve over time. “Arthoscopy for hand and wrist pathology is a minimally invasive surgical technique used to explore a joint from within. Tiny incisions are used to insert a fiberoptic instrument which serves as a camera to the inside of a joint and allows to not only diagnose a problem but often times concludes what definitive treatment should would be best for the patient. This is opposed to the more standard technique of open joint surgery, which can result in increased scarring and prolonged recovery time. 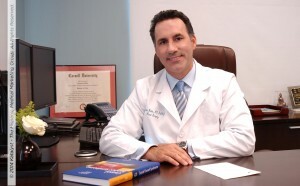 ” – States Dr. Alejandro Badia. Final treatment depends on the location, type, duration, and severity of the injury. Some injuries may require surgery, such as ligament tears. The key point to a fast recovery is to seek evaluation by a dedicated upper extremity specialist. The general orthopedic surgeon often addresses simple fractures, but the highly competitive athlete truly needs an optimal result in order to maximize their return to full function. Given timely and precise treatment, there is no reason why a professional or any sportsman should not be able to return to their regular lifestyle after sustaining an injury to their hand or wrist.